No matter how hard I try every season I have the urge to buy a new winter coat! I feel like coats are usually either super fashionable or super warm and it’s hard to find a coat that can be both. Let’s be honest, we all have that one coat that may not be the most stylish but we’d never part with for fear of freezing to death! On the other hand, we all have coats that probably don’t keep us the warmest but we look amazing wearing it and that’s all that matters, right? ;) You all know I shop at Nordstrom for just about everything in my wardrobe and right now they have the cutest coats (that are actually functional too). I have this same coat in a bright red that I bought two years ago and I’ve loved it and worn it so much I decided to get it in a second color, especially because the silhouette is timeless! Not only is it chic but I swear it’s the coziest thing and it keeps me super warm, perfect to wear all season long! wow this outfit is incredible! love the shoes they are so unique! Gorgeous outfit! I really love that Tory Burch bag, makes me want to get it. Love this look! That coat looks very cozy, and I love the booties too! Happy Monday! Looking so pretty in this outfit!! Love the coat! Love this coat and the color too! That coat is insanely gorgeous! I got my first Trina Turk item on sale over the summer, and her clothing is amazing! This is such a pretty coat! Love its style! When you live somewhere that’s so cold, I say it’s OK to own as many winter coats you want! Great coat! I have a very similar one in white and wear it all the time during the cold months! in love with the leggings! I just bought a coat in a similar style, but yours looks much cozier! Love it! That coat is gorgeous and the fact that it keeps you warm is even better. The selection at Nordstrom is amazing! Very pretty! You always look so stunning in hats. Loving the liquid leggings. Love that coat and those leggings on you! I finally caved and bought a new winter coat this season. My last one was ten years old, but an absolute favorite of mine. The coat looks perfect! I remember growing up having to fight with my mom about ugly bulky coats. She always made me have a warm coat over a pretty one and Id say but so and so has a pretty coat. She’s say something that maybe her mother didn’t care as much and on and on. I understand know and Id probably do the same thing with a child but let’s hope when the time comes I can find coats as perfect as yours for the kiddos and we all win! This look is AMAZING. I love all of the fall/winter colors! I love that coat! It looks super warm and cozy. So pretty!! Perfect autumn look, love the coat!! Love this…those booties are the cutest! Great outfit! Great coat! The boots are amazing, I love the chain detail on them. I need everything in this outfit!! 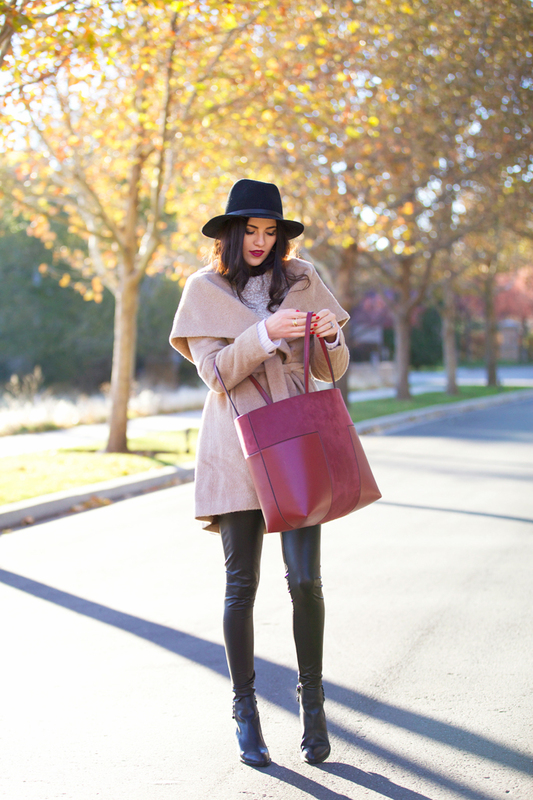 That coat, that bag, and those shoes – they’re perfect! Such an awesome coat!! And I love the boots! I’m obsessed with those boots!! I may need to add them to my collection! Gorgeous coat. Your new bag is a beautiful color. I always love Jeffrey Campbell’s shoes and these are amazing! Love the whole look. I agree that Nordstrom has a great selection of coats. This one you have on is fantastic. I love the color and how it ties at the waist. I just posted a burgundy coat that I wore during a snowstorm we had in Chicago over the weekend. Check it out if you have a chance. You look fantastic. I love that coat, it pairs beautifully with your leather pants! Such a lovely coat, Rach! I have to see it in the red, it must look lovely! It’s certainly hard to find a coat that’s both functional and gorgeous without breaking the bank! Thanks so much for sharing your favorites and I hope you have a wonderful day! I love the color of the bag. Such a great color for fall. Love this look!! Your booties and lip color are amazing!!!! That coat just looks so comfy! Agreed that some coats may not be the warmest, but that doesn’t mean they aren’t cozy! 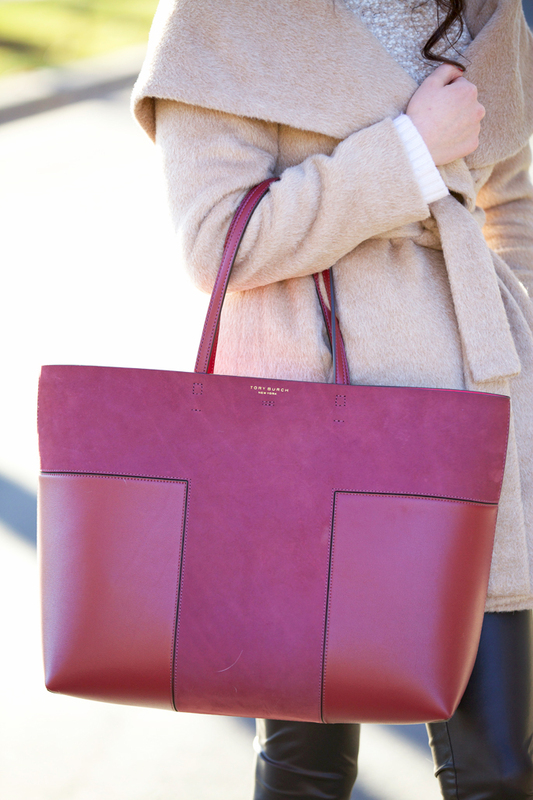 Love your tote! Perfect color and you can carry a lot in it! Gorgeous look Rach – and those boots are amazing! My favorite part of the look!! I am such a sucker for a stylish and eye catching short boot! Lovely chic outfit here Rach! Looks so cozy. I love your pants and the black booties look so cute with them! That bag ….. I need it ASAP! 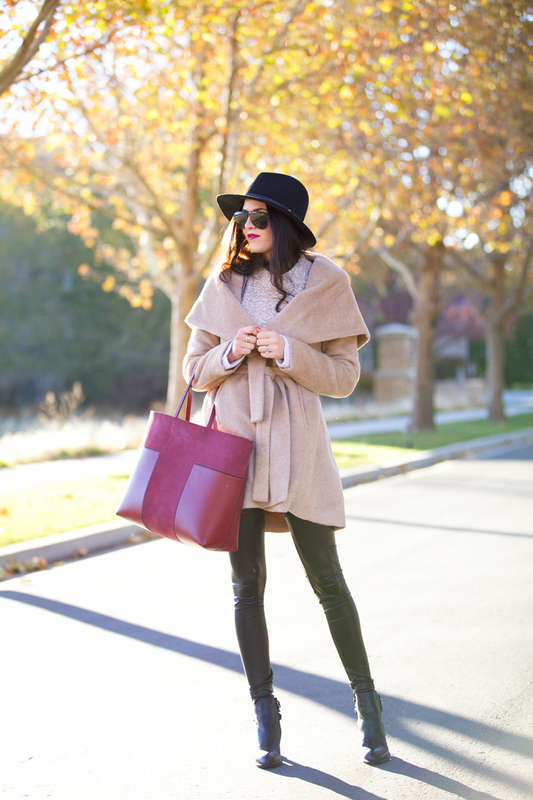 Great outfit – really LOVING that coat right now!! Ooo girl I love that bag!! I love the booties/legging combination you chose! LOVE this look! Those boots are so amazing. Combination of nature beauty and artificial beauty which create the bundle, handbag add more one beauty. That is such a beautiful coat! I wish they still had it in red too! Love the tones of this look..so chic!!! The design of the coat is timeless indeed and great to know that it is able to keep you warm too! Love the edgy chain design of the boots too, so cool! Love that coat, looks so cosy! This is such a great look! Question, where did you get the belt from? On the website it looks like there is just a button and not a belt? Did you have someone make it? Thank you for your time! I’m wondering the same thing as Mary above – where did you find the belt? Love this coat but would definitely want a belt with it if I were to order it. Thank you!